Be the first to share your favorite memory, photo or story of Sharla. This memorial page is dedicated for family, friends and future generations to celebrate the life of their loved one. Sharla J. 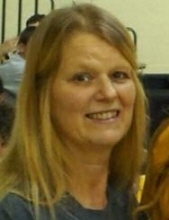 “Mac” McMillan, age 54, of Waynesburg, PA, passed away unexpectedly on Monday, March 4, 2019 in her home. Born December 7, 1964, in Washington, PA, she is the daughter of the late Richard F. Minda and Joan Marie Minda, of Avella, PA.
Sharla graduated in 1982 from Avella High School. She was a Cook at Eat n’Park in Washington, PA for 18 years where she met her late husband, Mitchell D. McMillan. Sharla was a Corrections Officer for SCI Fayette where she was employed for 11 years until her retirement in 2017. She enjoyed playing Bingo, fishing, hunting and riding the Harley motorcycle with her late husband, attending yard sales, pumpkin patches, fairs and going camping with family. Her cat lovingly known as Bear was her fur companion. Above all, Sharla loved her family and grandkids more than anything. She will be dearly missed by all who knew and loved her. In addition to her mother, she is survived by her three daughters, Lacey McMillan, of Spraggs, PA, Kacee (Blaine) McMillan, of Waynesburg, PA, and Macy (Curtis) Caldwell, of Wayneburg, PA; two grandchildren, Bentlee Allen and Kole Raymond McMillan; sister, Doreen A. Minda-Taylor, of Claysville, PA; brother, George (Jackie) Minda, of IL; mother-in-law, Charlotte “Punky” McMillan, of Waynesburg; nieces, nephews, great-nieces, great-nephews and friends. In addition to her father and husband, she was preceded in death by her father-in-law, William Toby McMillan. Friends are welcome Friday, March 8, 2019 from 2-8 p.m. at the Kesterson-Rush Funeral Home, LLC., 3275 W. Roy Furman Hwy., Rogersville, PA, 15359. (724) 499-5181 A funeral service will be held on Saturday, March 9, 2019 at 11:30 a.m. at the funeral home with Pastor Fran Skariot, officiating. A graveside service will follow at Rosemont Cemetery, Center Twp., PA. In lieu of flowers, memorial contributions may be made to Kesterson-Rush Funeral Home, LLC., P.O. Box 434, Rogersville, PA 15359. Please view and sign the on-line tribute wall at www.kestersonfh.com. To send flowers or a remembrance gift to the family of Sharla J. "Mac" McMillan, please visit our Tribute Store. "Email Address" would like to share the life celebration of Sharla J. "Mac" McMillan. Click on the "link" to go to share a favorite memory or leave a condolence message for the family.